They say that the entertainment industries are bereft of new ideas and continue to maintain themselves with an endless progression of repeats, rehashes, remakes, re-imaginings, or whatever synonym for dragging out yet another long-dead corpse of a respected title. Sure, the names and players may or may not be new, but the underlying story sure is. I now need to rush in this next thought before you take offense at that statement and jump straight down to the comments to take me to task: this is not necessarily a bad thing; it is not all that uncommon for the newer version to far surpass the original in one or more ways. For example, there have been a number of re-tellings of the King Kong story, the majority of which have been presented in far better color and resolution than the venerable 1933 Fay Wray version. And one must always pay homage to Mr. Peter Jackson for his stellar production values. Sure, casting Jack Black was ridiculous, but that does not moot my carefully caveat-enshrined stance. Newer is sometimes better. Naturally this is all leading up to something. 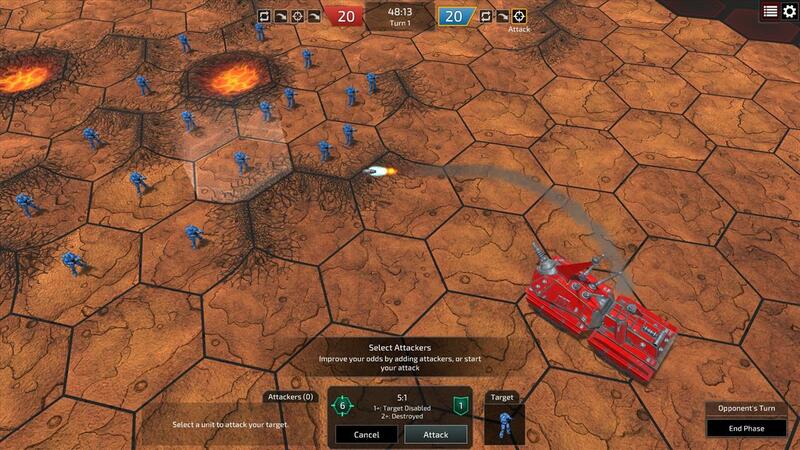 That “something” is the latest remake of Steve Jackson’s 1970’s board game OGRE, as developed by Auroch Digital. Before we get into the details of this new electronic version, though, it behooves us to explore the nature of the original game itself. At its core, OGRE is a game based on a mid-to-late 20th century take on what mechanized warfare would be like in the 21st century. Not incorrectly, Mr. Jackson visualized a battlefield comprised primarily of autonomous giant tanks, fast and nimble hovercraft, and small, portable battlefield-scale nuclear weapons. Human soldiers still played a role in this terrifyingly robotic type of war, although their primary strengths of flexibility and lower fiscal cost (a cavalier, yet necessary, calculation that excludes the inherent value of life) were somewhat affected by the need for orders of magnitude more expensive personal armor. When compared on a spreadsheet, and that's what is always comes down to, the exorbitant costs associated with massive battle tanks and associated mechanized equipment still surpasses that of such utilitarian necessities as squads of infantry. While the typical imagined 21st century army was comprised of large numbers of human and mechanical resources, there was also room for super weapons. This, too, has been often demonstrated throughout martial history. Even in the final days of WWII, Hitler was still searching for the one big weapon that could turn the tide of an already lost war. V2 rockets rained onto London. Massive railroad-based artillery cannons were able to flatten targets on the other side of the English Channel. Neither of those could win the war alone, though; it will always require boots on the ground to truly control a vanquished enemy and/or a dynamic battlefield. This is essentially the basis of the game of OGRE. In the OGRE world, “bigger-is-better” thinking inevitably led to the development of a true giant of the battlefield, which was (not surprisingly), called OGRE. The interesting thing about a large number of very large weapons is that they are not suited to every type of military need - they tend to have a single purpose. While a squadron of troops can take and hold a small town, an OGRE would only be of use as a last resort wherein the decision has been made to simply remove the entire town. Conversely, infantry would not stand a chance if tasked with destroying well-defended and well-entrenched fortresses. For work of that sort, a good ol’ OGRE is most certainly the better choice. Defending against an OGRE would, of course, be bloody difficult in both the literal and slang uses of the word “bloody.” Unless one has an OGRE of his own, the only viable alternative would be a fairly large number of more ubiquitous smaller pieces of armor, possibly combined with some well-fortified infantry squads. This brings us to the original version of the OGRE game. As previously mentioned, OGRE was originally designed by Steve Jackson in the late 1970’s. And as I have hinted at, the purpose of the game is to successfully destroy an enemy command post or, if playing as the defender, destroy the OGRE before it can do so. It’s a lot like the parable of David and Goliath, if one player is allowed to play as Goliath. As a reviewer, I must confess to having never heard of it, despite the time period of 1977 having been right smack in the era when I likely would have been most interested in it. As such, I am leaning quite heavily on Wikipedia to provide much of the history around its original design and the eventual advent of variants. So, according to that oft-reliable research tool, I can say that Ogre uses a hex map depicting barren terrain with only ridge lines and large, radioactive craters as obstacles. The defender sets up his forces in the more congested part of the map and the Ogre enters the opposite side at the beginning of the game. 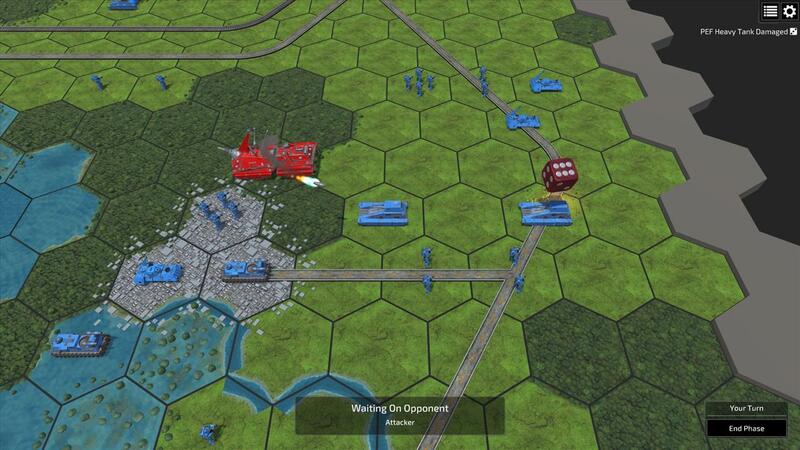 The basic version of the game has the attacker using a single Ogre heavy tank (referred to as a "Mark III Ogre"), while the advanced scenario gives the attacker the larger, more powerful "Mark V Ogre" tank versus an increased number of defenders, which seems only fair. The defender is allocated a certain number of infantry and 'armor units', but gets to decide the exact composition of his own armored forces. The different types of units encourage a combined-arms approach with each type being better than the others in different aspects. Heavy tanks have high attack and defense values with moderate speed and low range. Missile tanks have moderate attack and defense with moderate range and low speed. They’re basically the middle-child that excels at nothing, but at least has the good grace to not be entirely useless either. G.E.V.s ("ground effect vehicles"—roughly, heavily armored hovercraft) have very high speed (moving twice per turn), low attack, low range, and moderate defense. They are, however, very good at running away to a safe distance once they have finished an attack. Howitzers have very high attack and range but are easily destroyed (once an attacker has managed to get close enough), immobile, and expensive. You really want to get your money’s worth out of them as early as possible. According to Mr. Jackson, this balanced mix of units was not quite right in the first edition; the second edition sped up heavy tanks, slowed down G.E.V.s, and changed the defender's purchasing from "attack factors" to "armor units" (everything is considered equivalent, except howitzers, which are worth two of anything else). If my experience is trustworthy (hint: it’s not), he didn’t balance it quite enough. We’ll get to that later. All of this sounds pretty complicated, and not without reason. All of those metrics have to add up to something and they all have to be recorded somewhere for the easy edification of the player. And not surprisingly, there is an element of chance involved. That means there will be dice involved. Between the number of player pieces, the game board, and the hit chart that determines the success, failure, or partial effect of each attack, you’re looking at a $30 box of bits and pieces if you want to buy the paper-based game, along with the burden of calculating the relative odds and eventual results of any given attack when playing it. This is all further complicated by offering the attacker the opportunity to focus any attack on individual components of the target. Naturally, in 1977 there was no way to easily automate all of that. It wasn’t long before home computers became capable of the task, and the Apple II was the computer that did so in 1986. It strains the limits of credulity to think that more than a handful of diehards are still playing it that way. Three decades is a long time to wait for another computerized version of the game, but the day has come at long last: a new version of OGRE has been developed by Auroch Studios. The game allows for both the original version of the game, or the G.E.V. sequel which added more realistic map terrain rules than Ogre's "clear land and craters" system, as well as rules for overrun combat, spillover fire, and cover. 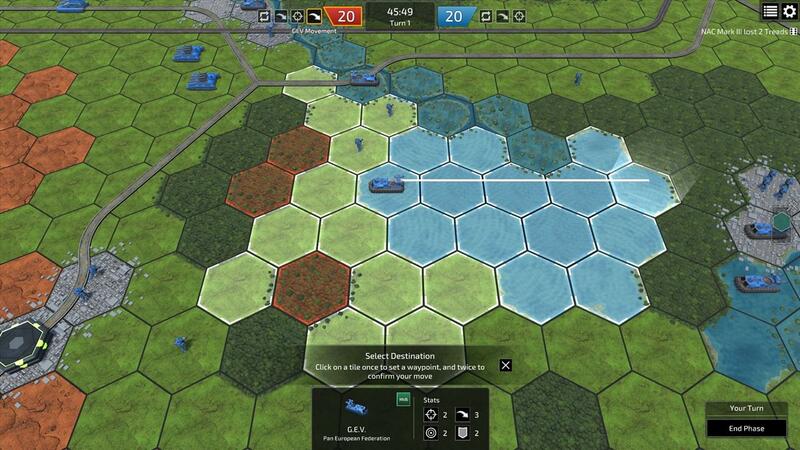 In addition to the obvious benefits of automated battle results computation and negating the risk of losing game pieces to curious toddlers or teething puppies (or teething toddlers and curious puppies), the PC version (available on Steam, natch) offers up the extremely valuable facet of online multiplayer, the very nature of which will save you a small fortune by obviating the need for beer and munchies for the guest. If nothing else, that will allow you to do what I have done: move up to Scotch whiskey as your game-playing lubrication of choice. And yes, doing so can have a detrimental influence on your playing ability, but since it also acts as a pain reliever, you aren’t going to care. If we stipulate that Auroch’s version of the game is utterly faithful to the rules of the original game, and I have no reason to believe otherwise, there is no point in offering an opinion on that aspect. Rather, what is important is whether or not there is substantial benefit to having it automated. There is, of course, as I have already pointed out, but that is only half of the equation. The net benefit relies heavily on whether or not the automation of the game introduces pain points of its own. Said another way, it’s not a benefit if you have to fight for it. In this case, there are a few more positive aspects to mention: the game is attractive in its presentation, the sound effects, which can be muted if you don’t like them, add quite a bit to the visceral feelings of simulated mechanized battle, and the game play flows nicely. There are also additional offerings such as the ability to design custom battlefields/scenarios and to create and play a game that does not involve the OGRE at all, thus going from a “big guy against a bunch of small guys” to a more equitable fight of equals. Well, at least a fight between parties provided with equal opportunity; outcomes are still dependent on what use is made of the opportunity. Balanced against the positive things are a few nits that I feel the need to pick. First, and I openly admit that this is my own fault, I went quite a few moves before realizing that my attacks were entirely ineffective because I hadn’t explicitly pressed the ‘Fire’ button. Stupid, that, but the game was more than willing to allow me to parade around like a brainless idiot. That was just a neophyte’s mistake, though, and I mention more to elucidate potential players than to criticize the game itself. There were other things that may or may not have been a simple lack of understanding on may part as well. As an example, I often ran into occasions where I could move a unit a number of units away from the fight, but only one space towards it. This could equally be listed as a feature; the rules are fairly esoteric at times and it’s nice to know that the computer is making sure that no one is cheating, either deliberately or accidentally. Those quibbles aside, I found it quite useful to have the computer perform the requisite chart look-ups and calculations to provide me with the odds of any attack succeeding. Actually, the odds would have been helpful on their own, but the game takes the next obvious step of translating the odds to what value I would need on the die roll. As an example, let’s say I had a collection of tanks and infantry close enough to attack the tracks on the OGRE. Once I would select the OGRE as my target, I could then select which of my units to include in the attack. I would click on one of my tanks and a pop-up would tell me that it would take a roll of 5+ to damage the OGRE. [Numbers approximate.] Adding another tank improved that to needing only a 4 or better. Adding infantry took that number even lower. It was easy to find the point where the law of diminishing returns said that adding any more units would be wasteful. Once I could routinely win the “me versus an OGRE” scenario, I moved on to the next scenario, which added a helper tank alongside the OGRE. And that is where I remain. I just can’t beat the combined pair of them. It is for that reason that I somewhat selfishly stated that the game balance is still a bit off. That is an abjectly self-centered and churlish comment, but hey, a guy has to do what he can to maintain even a semblance of pride. I’m still hoping that a different strategy will be effective, and at the end of the day, that is the very essence of a good game. See also: golf. That having been said, I am not here to review OGRE the paper-based game. You either are nostalgic for the days when you would happily spend hours playing it, or you’re in something of a retro mood and maybe tired of vast, open world, highly frenetic and ultimately unsatisfying blockbuster games and are looking for something a bit more sedate but still intellectually satisfying. If that is the case, this modern PC version of the game will easily satisfy. The interface takes a little getting used to, but the game still flows quite nicely. Every aspect of the original game appears to have been included in the PC version, but most of the ancillary effort of figuring out what happened to whom and when it happened is all taken care of for you. In short, if you are an OGRE fan, this is a worthy addition to your Steam library. If, on the other hand, you’re visualizing rapid paced action and cinematic mayhem, look elsewhere. Perfect for anyone that remembers playing the original in the previous century or folks looking to visit gaming of the past, Auroch Digital's OGRE is a faithful re-engineering of a venerable classic. You get all of the strategy and tactical action of the original absent the bookkeeping, lost game pieces, and requirement of having friends actually in your house to play.